Drama. There are number of big capitalization stocks that people just hang on to, like their teddy-bears that render solace in the most troubled times. They’re pejoratively called “defensive stocks” in the Wall Street jargon which suggests that we should only embrace the grizzly bear or ride the raging bull, and trade as much and as often as possible to avoid injuries. For example, Proctor & Gamble is widely regarded as a “defensive stock” and we talked about protecting the price rather than “taking profits” because the pundits suggest that the price is “too high” at $80 per share and up more than +20% so far this year. But this stock has been in the Perpetual Bond™ since $50 in 2009 and pays a steady dividend of 3% per year – which is pretty cuddly, and still much more profitable than an iThing or two has been for most of these guys (please see our Post, (B)(N) PG Proctor & Gamble Company, April 2013). 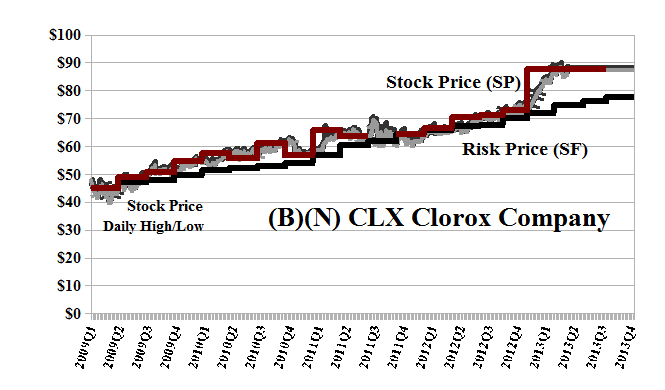 So today comes the Clorox Company which Credit Suisse suggests “has run its course” (Barron’s, May 15, 2013, Clorox Has Run Its Course: Credit Suisse) because it’s up +20% for the year, and ahead of the S&P 500 index which is only up +16%. They mention that the dividends are $0.71 per share per quarter or $275 million per year, year-after-year, to its shareholders for a current yield of 3.2%; but to them, yields are less important than “multiples” and only really important in bonds when there is a ±20 basis points difference that we ought to fiend over; and one thinks that they might not know the difference. The indicated downside volatility in the stock price is minus ($6) per share per quarter, so that we should not be surprised if the stock is trading between $80 and $92 off the current price of $86, and should certainly not be thinking about “cutting our losses” or “taking profits” in that range. Rather, we can protect the price against “surprise” by setting the stop/loss at $80, for example, which we can certainly afford; or setting a “collar” because even at $80 and a loss of $6, the stock price is still well above the current Risk Price (SF) of $75 and rising. And we can see (Exhibit 1 below) that the stock tends to trade very close to the price of risk which is that “benighted number” at which both “risk seeking” and “risk averse” investors can agree on the “right price” for their somewhat disparate – but not as different as Wall Street might have us think – needs (please our notes below, or for a more detailed description and more references, Bystanders & Collateral Damage, April 2013). The July put at $85 sells for $1.40 per share today, and the cost of that can be partially offset by a sold or short call against our long position at $90 which sells for $0.85 today, so that for a net cost of holding our position and the cost of the collar, $0.55 ($1.40 less $0.85), we can continue to collect our dividends and not worry about surprise in excess of $85 to $90 per share for the next several months. Sounds like a good, clean, deal to us; and we can always roll our options forward and up as more real information becomes available. Clorox Company is a manufacturer and marketer of consumer products. It sells its products through mass merchandisers, grocery stores and other retail outlets. From the Company: The Clorox Company manufactures and markets consumer and professional products worldwide. The companys Cleaning segment offers laundry additives, including bleach products under the Clorox brand, and Clorox 2 stain fighter and color booster; home-care products primarily under the Clorox, Formula 409, Liquid-Plumr, Pine-Sol, S.O.S, and Tilex brands; naturally derived home care products under the Green Works brand; and cleaning and disinfecting products under the Clorox, Dispatch, Aplicare, HealthLink, and Clorox Healthcare brands. Its Household segment offers plastic bags, wraps, and containers under the Glad brand; cat litter products under the Fresh Step, Scoop Away, and Ever Clean brands; and charcoal products under the Kingsford and Match Light brands. The companys Lifestyle segment provides dressings and sauces primarily under the Hidden Valley, K C Masterpiece, and Soy Vay brands; water-filtration systems and filters under the Brita brand; and natural personal care products under the Burts Bees and güd brands. The Clorox Company also markets its products primarily under the Javex, Glad, PinoLuz, Ayudin, Limpido, Clorinda, Poett, Mistolin, Lestoil, Bon Bril, Nevex, Agua Jane, and Chux brands. The company sells its products primarily through mass merchandisers, warehouse clubs, grocery stores, other retail outlets, distributors, and medical supply providers, as well as a direct sales force, combination of direct sales teams, and network of brokers. The Clorox Company was founded in 1913 and is headquartered in Oakland, California. The calculated Risk Price (SF) is a provably effective estimate of the “price of risk” which is “the least stock price at which the company is likeable” (Goetze 2009) and “likeability” is determined by the demonstrated factors of “risk aversion” – we want to keep our money and obtain a hopeful return above the rate of inflation – and the properties of portfolios of such stocks. Stock prices that are less than the price of risk can be said to be “bargain prices” but with the risk attached that the company might never get a higher price other than that due to ambient volatility or “surprise”; on the other hand, investors who are willing to pay the “full price” above the price of risk, and buy and hold the stock at those prices, must also be confident, and have reason to believe, that the company will produce those values, absent new information. Please see our Posts, The Price of Risk, August 2012 and The Nash Equilibrium & Its Stock Price, October 2012, for more information on the theory. To see what else “risk averse” investing can do for us, please see our recent Posts, The Wall Street Put, April 2013, and earlier Posts such as The Dow Transports, March 2013, or The Risk Adjusted Dow, March 2013, or The Canada Pension Bond, February 2013, and for a more colorful description of investment risk and the application of the “price of risk” to mergers & acquisitions, please see our Post, Bystanders & Collateral Damage, April 2013.